Ever wanted to make your own Puppet? 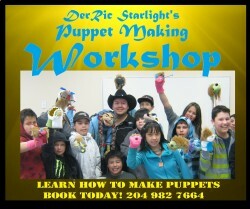 "DerRic Starlight's Create-A-Puppet Workshop" can help. This Workshop presentation is open to all ages from adults to children alike! MONSTERS, ANIMALS, PRINCESSES, SPORT PLAYERS to whatever your mind creates! Book today for Conferences, Schools, Daycare, Camps, Pow-Wows and Parties!!! To Book Online Fill In The Buyer Request Form ! More Info On DerRic Here !